US Chief Justice John Roberts’ recent order to review the federal court’s code of conduct and sexual harassment policies for investigating and correcting inappropriate behavior is a timely cue to evaluate your organization’s Code and ethics and compliance training. Here are five questions to ask as you consider whether your workplace Code of Conduct training needs a reset for 2018. Is the training relevant for my business and workforce? Your Code of Conduct training should be tailored to your organization and emphasize what’s most important to your business and industry, including all the pertinent topics, terminology, examples and visuals relevant to your business. If you’re a retailer and your ethics and compliance training is geared to financial services, it won’t be relatable to employees, partners and third parties. Is the training up to date? In today’s complex business environment, keeping your Code of Conduct training up to date is essential for managing new risks and educating employees on how new or revised laws and regulations may impact their work. To ensure employees are aware of the changes, schedule regular, periodic training for everyone – including senior management, supervisors and third parties. Does the training help my employees develop decision-making skills? Interactive training that involves employees in the decision-making process can be a motivator for changing behaviors and attitudes. One powerful technique is to immerse learners in interactive scenarios that challenge them to choose how characters should respond to specific situations. Integrating these kind of learn-by-doing exercises into your training promotes knowledge retention, while demonstrating in a dramatic way that actions and decisions have consequences. Does the training provide clear guidance on how to report misconduct? 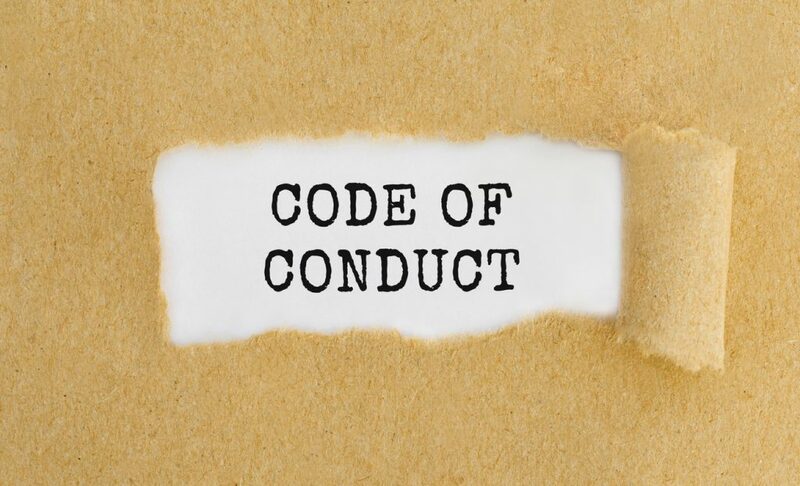 Code of Conduct training should provide clear guidance to your workforce on how to recognize Code violations – for example, what constitutes a bribe or a conflict of interest – and how to report suspected illegal or unethical behavior. The training should include information on how to access your ethics hotline and other ways that employees in all locations can report issues, either directly or anonymously. Does the training survey end users? You won’t have to wonder how employees feel about your Code of Conduct training if you ask them. Training courses that conclude with a brief survey provide you with real-time feedback on how employees rate their training experiences. Take a cue from Chief Justice Roberts by making it a priority to evaluate your Code of Conduct training. If the training isn’t up to date, relevant to your workforce and visually dynamic, it’s time for a reset. Look for interactive Code of Conduct training that makes the best use of eLearning technology and strategies to empower employees to make the right decisions when facing everyday ethical dilemmas, including how to report misconduct whenever they see it or suspect it.